Imbolc means “In the belly” – referring to the time when ancient Celtic peoples noticed the pregnancies of their flocks and also is the ancient festival of “New Milk” – their sheep starting to make milk for the new lambs. In fact, it is one of the four Greater Sabbats of the year as celebrated by the western European Celtic peoples of old – and still today by many Neopagans. This is the pregnancy of the Goddess. It has been celebrated in much of the world as a Festival of Light. We can find great similarity and archetypal significance in the many observances of the sun regaining its strength and power, such as the Christian celebration of Candlemas (the Feast of the Purification of the Virgin), Lupercalia, (the Roman end-of-winter festival), the myth of Amaterasu’s being coaxed from her cave of darkness by the other gods and a dancing goddess holding a mirror... The Ancient Egyptian feast of Heru around Feb. 6th, when Heru (Horus) “Light”, defeats Set “Darkness”, has its origin in the Awakening too. There are many other examples from around the world. 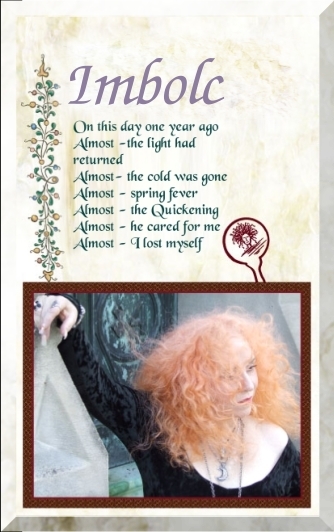 Also read my article on Imbolc at my author site RowenaWhaling.com for even more information!